By the time November rolls around, we are already starting to think about Christmas and all the things we need to fit in before the celebrations begin. One thing on that list for many is Christmas cards. Christmas cards seem to have lost some of their popularity over recent years with many opting for text messages or even digital Christmas cards to save on postage costs and time, however there is something really special about getting a Christmas card in the mail. And you know what makes a Christmas card even better? When it’s handmade! I love making Christmas cards. It is a small token of kindness to remind others you are thinking of them, because life gets so busy. Knowing you will make them smile is a great feeling! Of course there is also the fact I have an unhealthy collection of scrapbooking papers and embellishments that need to be put to good use! Let’s face it though… making a bucketload of Christmas cards by hand is a time consuming task and a tad overwhelming. Or is it? It’s time to get to business and the best way to get going is to keep it simple! Very simple. And there is absolutely nothing wrong with making them all the same or similar because it means you can work in bulk. Cut out the background for each card first. This means you can start with all the cutting before you do all the sticking. Think of it as a handmade card production line! It only takes an extra couple of seconds per card but adding some texture with inked edges on your paper or distressing the edges by roughing them up with scissors can add some extra interest without requiring a lot of time or fancy scrapbooking skills. Then the final step is to work on adding style and embellishments to finish them off. Keep them relatively flat if you are posting them. Buttons and stickers, twine, chipboard and stamps. And there you have it… your cards are done in a flash and now all you need to do is get a hand cramp writing out all the messages and envelopes! 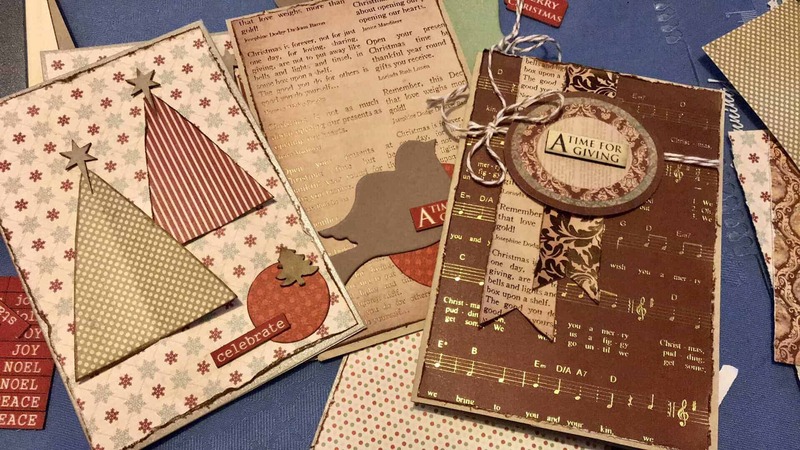 You can even do similar with birthday cards or all occasion cards at the start of the year so you are ready to go for all the events and celebrations that are coming up for the year. I always keep a few pre made cards ready for short notice special occasions. This article may contain compensated links. See our full disclosure here. Holly is the Editor and Owner of Simplify Create Inspire. She is an Aussie mum, wife, and corporate drop-out, focused on simplifying and finding that elusive work/life balance, while juggling her own business. She also owns a family travel blog to document her other big passion, - exploring the world.